In case you've somehow forgotten, there's this thing we do every year where we make a little magic happen. Okay, so maybe it's a lot of magic. Here's the lowdown -- Christmas Crazy has existed for several years now. It's my way of making a little magic with this website for some kids who otherwise wouldn't have magic. They're kids who are receiving services from Center for Victims, a fantastic Pittsburgh non-profit that helps people who are victims of or directly impacted by violence. Some of the kids are children caught in the middle of a domestic violence situation. Some of them have seen things kids should never see. All of them deserve a little magic. The only way to make this all happen is to get a little help from you. Shop from the wish list. I'll be adding to the wish list several times over the next week, so if nothing tickles your fancy, no worries. I got you. Whether you've got $5 to spend or $500, it all helps. Christmas Crazy <------ Wish list link! Or click on the reindeer to donate a few dollars and I'll do the shopping. No matter what, every little thing will find its way to a kid in need. Want to say that you were a part of that giant pile when it gets delivered in a few weeks? ME TOO! Let's do this! Let me know if you need an extra set of hands at any point! You are the best. Thanks for making this possible. Some people need to hear a song. 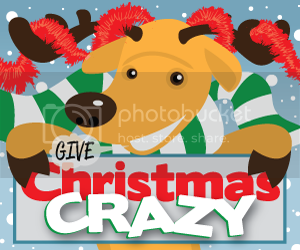 I need Christmas Crazy to make it Christmas!!! I was going to reshare Christmas Crazy today but found the link isn't working for me any more. Is it just me?